A recent ruling by the Appeal Court of Bilbao -confirming an earlier ruling by the Court of First instance-is to set the ground for future cases on the so-called Equity Release mortgage loans. Three Judges in the Basque High Court have ruled that banks -and by extension any other financial services company- that do not have a valid operating license will see their agreements declared null and void, be it mortgage loans, investment contracts or any other. In late 2014, 20 pensioners (mostly British) bought an action to set aside 12 equity release mortgage loans -worth 6 million euros- against SLM, a Cheshire-based lender. The lender had not secured the mandatory regulatory license although they did warn they had no license to operate in Spain as, according to them, they were only providing lending for customers seeking to raise cash on their homes. Now, the Bilbao Appeal Court has said the warning was no ‘mitigating’ factor because it misled the claimants into believing that the loan they were sold was financially secure when, in fact, most of it was invested via unregulated Isle of Man-based-dubious Premier-Group. The relevance of the ruling, which brings an end to the suffering of the victims of this scam, is twofold: it nullifies contracts issued by unregulated companies and it fully endorses the allegations of the claimants that the widely publicized Inheritance Tax benefits were false, emphasizing that such conduct is deceitful and fraudulent. It is believed that defunct Luxembourg-based Landsbanki Bank had lent a staggering 100 million euros in Spain to reduce death duties that thankfully will be difficult to recoup, whilst Rothschild Group could be set to lose 40 million Euros. Landsbanki’s Yvette Hamilius could not care less about people. The insensitive, greedy and immoral banker – currently indicted on a criminal case in France- would sooner evict an 85-year old sufferer of Alzheimer than to accept that sometimes, there is a line that you cannot cross over. But she cares not and will do all that is within her powers to leave elderly people destitute. Unfortunately for her, on this occasion lawyers acting for an octogenarian couple victim of Landsbanki’s predatory banking have managed to persuade the Courts that it is not right to evict ailing elderly people. The Ronda-based Judge denied Landsbanki’s petition to have the lady summoned once again. As a result of this setback, the lender has resigned to the fact that it may not be possible to just pull her out and thus, have agreed to have the Spanish Prosecutor Service representing the victim, as petitioned by lawyers acting for her. A ruling by the Courts in San Roque nullifying foreclosure proceedings, issued last December, is pending ratification following the Courts’ bizarre decision -not based in law- to grant a new term for the bank to produce a correct document (subsequently appealed). This earlier ruling demonstrates Landsbanki’s contempt for Spanish laws, whether procedural (failure to produce statutory documents) or substantive (flouting Inheritance Tax prohibitions). Lawyers for the defendants expect a definitive ruling annulling these foreclosure proceedings to be issued in due course. Court Number 1 in Marbella has ruled that a mortgage foreclosure claim brought by Landsbanki should be set side and declared null and void. The Court was satisfied with the allegations, submitted by a Landsbanki Equity Release Victim, concerning faulty and/or insufficient notification of claim and defective filing. Landsbanki representatives attempted to rectify their error at a later stage during the process, being rejected forthwith by the presiding Judge. Landsbanki has the right to appeal with the Malaga Appeal Court, which they may do within the next 20 days. This option appears unlikely as there are no objective grounds to do so; there are crucial documents missing and the ruling is clear. If Landsbanki do not appeal or they go ahead and lose the appeal, the foreclosure route will be closed for good, forcing Landsbanki to issue declaratory proceedings, slower and with ample scope for the victim to argue the fraudulent nature of the contract. A Marbella Court has ordered a stay of foreclosure proceedings following a ‘null and void’ petition submitted by lawyers acting for the defendant. The application to the Court is based on fundamental breaches of civil procedure laws, namely failure to identify the correct sum that Landsbanki is demanding from the borrower. Landsbanki has so far only foreclosed on company-owned property, that we are aware of. Should the Court set aside the foreclosure procedure, Landsbanki would have to pursue the debt via a laborious ordinary case where parties get equal opportunities, as opposed to foreclosure proceedings. Landsbanki has 5 days to challenge this decision. The French Court considers that these individuals may be liable, prima facie, for “fraud, breach of trust by an individual engaged or providing assistance on a regular or ancillary basis in transactions involving the property of third parties for which it recovered funds or securities”. The man of the picture is unique in that he has sold Equity Release for not one, but two banks! His first post was with Landsbanki Marbella wherefrom his scaremongering tactics bought immense success to his company. When the s**t was about to hit the fan, he jumped ship and found cover in Gibraltar, working for a no less amoral company: Jyske Bank. Although years have passed since this young-ish looking gallant banker posed for the defunct magazine, you may still be able to guess who he is within this list. Three former executives of the Luxembourg subsidiary of the Icelandic bank Landsbanki were indicted for fraud in Paris, announced Thursday AFP a source close to the case. The court granted prior information on the Icelandic financial crisis of 2008 mortgage was opened in 2009 after complaints from individuals who are victims of this controversial financial product, including Enrico Macias singer. Before the investigation, Judge Renaud van Ruymbeke has already indicted in 2011 Luxembourg subsidiary in bankruptcy for “fraud” and “lack of approval.” The judge placed under judicial supervision with the obligation to pay a deposit of € 50 million, a record amount in France. It is now the men who sold the loan that are covered in a folder at the root of a showdown between the French and Luxembourg justices. In recent weeks, Mr. van Ruymbeke delivered indictments for “scam” of three former executives of the bank: Torben Bjerregaard Jensen, a Danish national, Olle Lindfors, a Swede, and Failly Vincent, a Belgian, according to the source familiar with the matter. Cash-strapped, Landsbanki has offered through its subsidiary in Luxembourg from 2006 to 2008 for individuals to mortgage their homes in exchange for favorable loans. Assembly, complex, meant that the borrower receives a portion of the sum, while the bank reinvested the rest markets. The value of this portfolio would grow to the point of covering all aspects of the loan, which was repayable upon its conclusion. 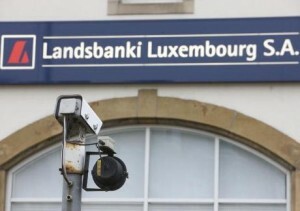 Before the judge, the three men indicted contested that Landsbanki Luxembourg could promise customers that the investment returns would cover all repayments, according to a source close to the investigation. Hundreds of individuals, particularly in the south of France, Spain and Portugal, had signed these loans. But in the wake of the bankruptcy of the Lehman Brothers bank in September 2008, several Icelandic banks had collapsed, including Landsbanki, which was nationalized in emergency. Consequence of the crisis, the investments offered by Landsbanki Luxembourg have lost much of their value. Moreover, some of these investments were other than obligations of the parent company. Paid once for subscribers to find other means to repay their loans. Where complaints of fraud by these individuals, some of whom have been ruined. They accuse the bank knowingly proposed financial package without checking the repayment capacity of clients. The case is also played in Luxembourg. In bankruptcy, a subsidiary of Landsbanki has assigned its subscribers before the Justice of the Grand Duchy to enforce the loan guarantee-to-sell the mortgaged homes in order to pay its own creditors, chief among them the Central Bank of Luxembourg. In early 2012, the Luxembourg court objected that the liquidator of the subsidiary pays the deposit of € 50 million ordered by the French justice. At the request of the plaintiffs, Judge van Ruymbeke responded by ordering the seizure of mortgages held by the bank on several investors. A decision which has theoretical consequence to prohibit Landsbanki claim to French investors the loan. However, the bank appealed that decision in an appeal that will be reviewed in February by the investigating chamber of the Court of Appeal of Paris. It was a matter of time before someone high up in the banking sector was sent down. Kaupthing bosses have the dishonour of being the first -surely not the last- top bankers to go to prison for defrauding their company, their clients, their country and presumably too, the Tax Office. 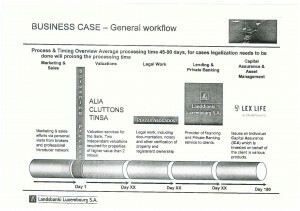 But whilst this case may not be directly connected to Equity Release, it is clear that if someone at the bank came up with the brilliant idea of giving out a massive loan to a Middle East-based wealthy Arab to buy stock from the company, why not give smallish loans to owners of Spanish unencumbered property to invest, for instance, with Lex Life, the company Landsbanki owned? It has been discovered, with some distress we may add, that the much flaunted Court victory of a Landsbanki victim in 2011 had more to it than met the eye for, whilst the victim won a ruling in the First Instance declaring the mortgage loan and the investment contract void, the ruling was subsequently revoked entirely, on appeal, by the Málaga Appeal Court (ruling dated 18th February 2013). – OMM was sued together with Landsbanki, but Lef Life was left out (even if their contract was attacked by the claimant’s legal representation). – The claim was based heavily on mis-selling within a financial investment contract, as opposed to an Equity Release contract or even a mortgage loan but then, the party to the financial product -a Unit Linked Life Insurance Policy- was not sued jointly. – Mentions were made to IHT benefits but apparently so, no evidence that this constituted fraud or, at the very least, not proven. The Court of Appeal in fact admits that the substance or essence of the contract is actually Tax Mitigation, and that there is no error there (!!!). More so, the Appeal Court does even go to name product, Spanish Inheritance Tax Reduction Arrangement (SITRA). – The claim confused the mortgage loan contract with the investment portfolio contract, and it was not proven they were one single overall agreement with several contracts in it: the Malaga Appeal Court outlined this. – The claim invoked the 47/2007 Securities Markets Act when it was not applicable at the time of the claimants signing their ER contract. On a side note, we must add that OMM came out victorious for 2 reasons: a) they were deemed as business introducers, nothing more and b) even if they were selling financial products, the Court found that life insurance unit-linked contracts were within their remit, considering they did have an insurance brokerage license. The upside is that the Court of First Instance did find both defendants guilty of mis-selling which should make Landsbanki wonder what would happen if, for instance, a new claim was filed against them addressing all the above shortcomings/incorrections, as they were highlighted by the Appeal Court, in particular the position of the Spanish Tax Office.